To be effective, your website needs a content management system. 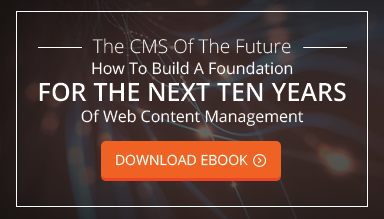 But that simple truth is complicated by the fact that a seemingly endless number of CMS solutions vie to be your new content management software. Are any of them right for you? Especially if you are looking to attract business customers, the answer may be no. Here are 4 ways in which a custom CMS will strengthen your b2b website more than an out of the box solution ever could. Most obviously and as the name suggests, a custom CMS gives your business more customization options than an out-of-the-box solution ever could. That is especially important considering that most content management systems are optimized to produce content aimed at individual consumers, which don't always overlap with the needs of business customers. Being able to customize your CMS means developing a solution that works for your individual business needs. You probably rely on a very specific set of content and sales processes and workflows to reach your target audience digitally. A custom solution ensures that your website is optimized for the needs you know you have, not others' needs. Especially if you already engage in content marketing, you need a CMS that accommodates your unique need for content development. Most solutions now provide some type of blogging tool for basic content marketing functionality. But if you rely on more in-depth types of content, such as white papers or webinars, you need a CMS that helps you develop and promote pages directly related to your offerings. In addition, you will get social media integration with not just the most common networks, but the ones that make the most sense for your business audience. Blogging is extremely important in B2B marketing, but it may not be enough to successfully reach your audience. A Custom CMS supports your individual content marketing strategy to maximize your outreach and lead generation. Generally speaking, custom content management systems are more secure than their pre-configured counterparts. A system like WordPress, for example, is vulnerable specifically because it is so popular. Its code is well known, making it prone to both targeted and accidental attacks. A custom CMS, on the other hand, is not built using a globally available template, making it more secure. In addition, you can more easily set up customized user security rules, ensuring that all employees only have the access they need to perform their work and avoiding mistakes and internal breaches as a result. Chances are that after an initial adjustment and training period, every type of CMS will work well for a while. But once your business begins to grow, will the CMS scale with it? If you go with a pre-built solution, the answer is most likely no. And if your business evolves to target a new audience or change its content marketing strategy, you may be stuck with the solution you signed up for in the first place. A custom CMS, on the other hand, provides the flexibility you need to adapt easily. No business is stagnant and even established B2B organizations will need to change their approach or expand their audience at some point. Working with a CMS that can change and evolve with you is crucial for long-term success. In short, a custom CMS will significantly strengthen your B2B website. It enables you to customize functionality, optimize your content marketing for your audience, increase your internal and external audience and maintains flexibility for both the short and long term future. Is a Website Enough? Not Anymore. Our team is available to answer questions you may have. Contact us today! we have a lot to talk about, partner. © 2001 - 2019 New Possibilities Group, Turning possibility into reality. Our team specializes in custom, complex solutions to your biggest challenges. We make your website the center of your digital ecosystem. Meet the NP Group in 30ish seconds!